What Makes A Good Children’s Book? Everyone is a book critic these days. The internet, for better or worse, has given voice to anyone with a connection and a few moments to spare. Customer reviews on Amazon.com, personal blogs, fan websites, and comments on publisher websites; the opportunities to share one’s opinion are countless. But does the average Joe or Jane know what makes a good children’s book? I’ve worked in children’s publishing most of my adult life, and sometimes I wonder if I actually know. I’ve done a little research and rounded up the following articles addressing this very subject. What makes a good children’s book? Give these articles a quick read and see what conclusion you come to. Although Dr. Seuss passed away in 1991, he still continues to dominate sales records in children’s book publishing. His amazing catalog of published works has bridged the gap between multiple generations, thereby becoming a symbol of childhood worldwide. This data has been compiled by Publisher’s Weekly, and the figures are based on print unit sales at outlets that report to NPD Bookscan, which tracks roughly 85% of the print market. Dr. Seuss’ success so many years after his passing is truly a remarkable achievement. The majority of children’s books reach their greatest sales levels within the first 2-4 years of publication, but Dr. Seuss’ popularity continues to increase. In fact, his sales figures increased by 50% between 2010 and 2013. A surefire recipe for entertaining your kids—after school, during school breaks, vacations or “staycations”—is to bring them into the kitchen. Mastering cooking techniques can be more than entertainment; it can reinforce math skills such as counting, measuring and separating, as well as improve hand-eye coordination. We have safety guidelines and a list of age appropriate kitchen skills and tasks. When you have finished your baking project, download and print our free Baking Certificate! There’s a new lesson plan for each week in February. 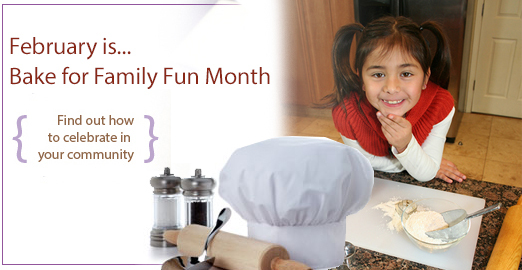 Each lesson plan is designed to inspire home bakers while teaching fundamentals of cooking. Week #1 – Let’s Get Started Baking – Bake Buttery Breakfast Biscuits and learn how leavening makes batters rise. Week #2 – Baking For My Valentine– Bake up some Red Velvet Cupcakes, download and color a Valentine card. Week #3 – History and Traditions – Corn bread, Johnnycake – history of corn and other names for corn. Week #4 – Baking For Others – Muffins – done the way you like them! Sweet or savory muffins are delicious family fun treats to bake and share. Thank you to Clabber Girl, a member of the Home Baking Association, for providing this amazing content for Bake for Family Fun Month. In addition, check out the Home Baking Association resource Baking with Friends: Recipes, Tips and Fun Facts About Baking for Kids. The book is written by Charlene Patton, Sharon Davis, and edited by Nicholas Beatty. Enter your email address to follow Booksprocket and receive notifications of new posts by email.